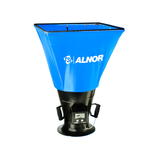 The Balometer Capture Hood is the ideal way to measure very low volumetric flow. The combination of their light-weight and easy-to-use design makes these loflo capture hoods a great instrument for residential or light commercial use. Also check our Liquid Doppler Flowmeter Equipment!